In the author’s classroom, students pick a comfortable option as their primary seat. According to the Association for Middle Level Education’s book This We Believe, education for young adolescents must be developmentally responsive, challenging, empowering, and equitable. In my 13 years of teaching seventh-grade English, I have updated curriculum, lessons goals, assessments, and instructional methods to best suit each group of students. While all of these changes have been, and continue to be, crucial in improving the education I provide to my students, the one piece I found to be missing was an update to my classroom environment. For over 100 years, classrooms have been organized around desks in rows. I tried moving away from having the 30 desks in rows, but I started to notice that the desks themselves were more of a hindrance than a help to my students as they transitioned from one lesson activity to the next. 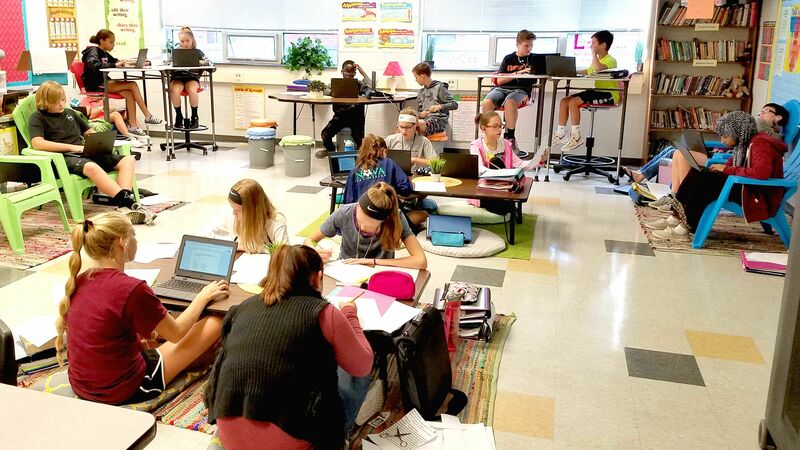 When given the choice, they overwhelmingly preferred to stand at the counter or stretch out on the floor to complete a task, rather than sit in a traditional desk. In response to this observation, I started researching classroom design, and then approached my building principal to outline my vision for flexible seating in the middle school. I obtained approval to take this calculated risk and spent my summer gathering unused materials, writing grant proposals, and making a lot of seating options myself. I created three different levels of seating—floor level, regular table height, and standing or high-top table height—with a total of eight options. The floor-level options are tire seats with pillows, a video-gaming rocker, and padded seats at low tables. For regular table height, I have plastic molded chairs and padded bucket stools at tables, and Adirondack chairs. And for standing height I have high tables with rolling chairs and counter space where students can sit or stand. As the start of the school year approached, I switched my focus from creating the physical space to introducing and implementing this new classroom environment to students and parents. This was the part I was most anxious about, because I had always had strong classroom management. Would this change cause chaos in my otherwise structured world? I pushed negative concerns aside and started to create my plan for implementation. I turned to my research and outlined expectations and routines for my students. A lot of my research came from elementary and high school teachers, so I relied heavily on my own experience in middle level education to predict issues and to incorporate solutions within my model. A student uses the video-gaming rocker in the author’s classroom. On the first day of school, I watched in awe as students exuberantly entered my classroom and looked around to find a seat. I instructed them to try a new seat each day so they could figure out what worked best for them, and I outlined the ability for students to move to a different seat if they couldn’t see the board clearly, were distracted by a nearby peer, or felt the need to use table space instead of a clipboard. To my surprise, my students immediately took ownership of their learning and followed my expectations perfectly. I presented my philosophy behind making this environmental change to parents at back-to-school night, and watched as their heads nodded in agreement when I discussed my rationale for flexible seating with middle level students. 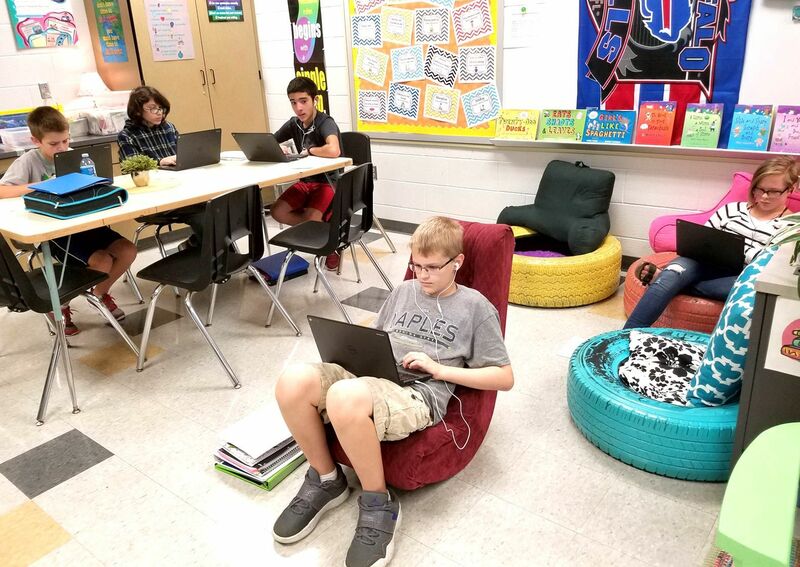 Although I had brought in standard desk chairs to accommodate them, all of these parents opted to try out the flexible seating options their students had been telling them about all week—the floor pillows, Adirondack chairs, tire seats, bucket stools, and so on. The parents’ enthusiasm helped break down the last bit of skepticism I had in the back of my mind. In week two, I gave a survey to get feedback and have students rank their preferences, in order to determine each student’s home base seat. Home base seats are used for attendance, for initial direct instruction, and for when substitutes cover my class. Students ranked the eight seating options, and I was able to assign every student to one of their top three choices. They’re allowed to move around but typically choose to stay in their home base seats since those were assigned based on their personal choices. When it comes to individual work, partner collaboration, or whole-group discussions, students are quick to follow my lead with the voice volume expectation. I continue to monitor attention to task, and my students seem very eager to please when it comes to using their classroom work time wisely. The calculated risk to try flexible seating has definitely paid off for the learning community in my room. For example, none of my emotional-support students have needed or requested so much as a break this year. And recently, when a student brought in a copy of the Pennsylvania State Education Association’s Voice magazine and pointed to a photo of my classroom, I noticed that for the first time, instead of referring to “Mrs. Markle’s room,” students called it “our room.” The shift in ownership has empowered students and has been the biggest impact I’ve seen this year. Students are taking more responsibility for their own learning as they see me model risk-taking in the classroom, and the flexible seating environment has played a large role in that shift.